Knowledge translation (KT) aims to close the research-practice gap in order to realize and maximize the benefits of research within the practice setting. Previous studies have investigated KT strategies in nursing and medicine; however, the present study is the first systematic review of the effectiveness of a variety of KT interventions in five allied health disciplines: dietetics, occupational therapy, pharmacy, physiotherapy, and speech-language pathology. A health research librarian developed and implemented search strategies in eight electronic databases (MEDLINE, CINAHL, ERIC, PASCAL, EMBASE, IPA, Scopus, CENTRAL) using language (English) and date restrictions (1985 to March 2010). Other relevant sources were manually searched. Two reviewers independently screened the titles and abstracts, reviewed full-text articles, performed data extraction, and performed quality assessment. Within each profession, evidence tables were created, grouping and analyzing data by research design, KT strategy, targeted behaviour, and primary outcome. The published descriptions of the KT interventions were compared to the Workgroup for Intervention Development and Evaluation Research (WIDER) Recommendations to Improve the Reporting of the Content of Behaviour Change Interventions. A total of 2,638 articles were located and the titles and abstracts were screened. 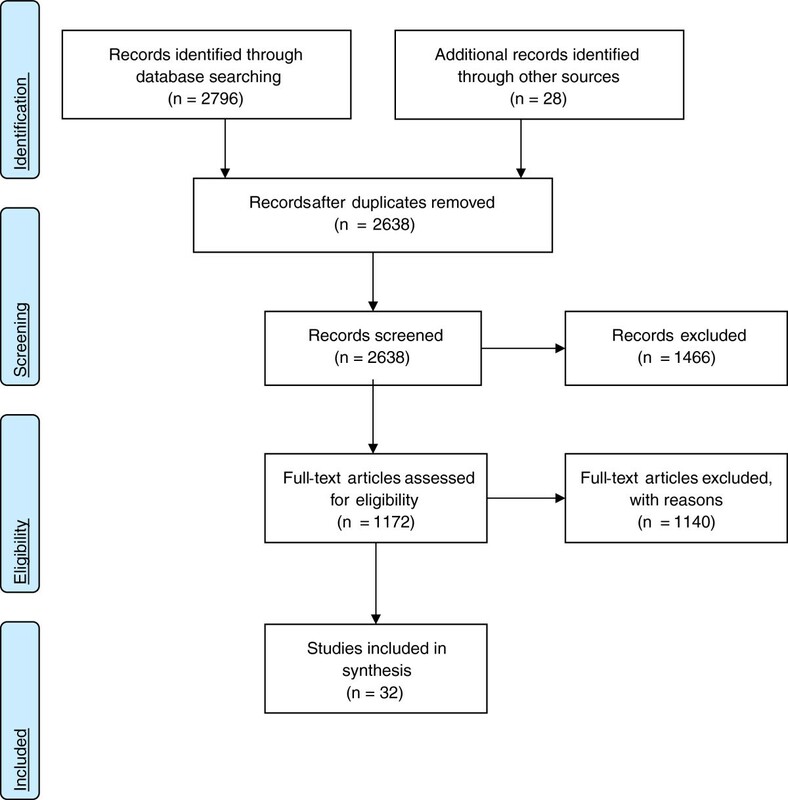 Of those, 1,172 full-text articles were reviewed and subsequently 32 studies were included in the systematic review. A variety of single (n = 15) and multiple (n = 17) KT interventions were identified, with educational meetings being the predominant KT strategy (n = 11). The majority of primary outcomes were identified as professional/process outcomes (n = 25); however, patient outcomes (n = 4), economic outcomes (n = 2), and multiple primary outcomes (n = 1) were also represented. Generally, the studies were of low methodological quality. Outcome reporting bias was common and precluded clear determination of intervention effectiveness. In the majority of studies, the interventions demonstrated mixed effects on primary outcomes, and only four studies demonstrated statistically significant, positive effects on primary outcomes. None of the studies satisfied the four WIDER Recommendations. Across five allied health professions, equivocal results, low methodological quality, and outcome reporting bias limited our ability to recommend one KT strategy over another. Further research employing the WIDER Recommendations is needed to inform the development and implementation of effective KT interventions in allied health. Strategies to close the gap between research and practice, in the context of the knowledge user, have been identified as a means to realize and maximize the benefits of research through improved health outcomes, better health services and products, strengthened healthcare systems, and more effective health service delivery[1–3]. The field of knowledge translation (KT) aims to close the research-practice gap through the development and implementation of KT strategies, which include a variety of professional, financial, organizational, and regulatory interventions aimed at changing healthcare professional behaviour (i.e., change decision making, change treatment, and management) to be aligned with evidence-based recommendations. While there is a growing understanding of the implementation and effectiveness of KT strategies, the bulk of the research evidence comes from the medical e.g.,[4–9] and nursing literature e.g.,[10, 11]. Presently, evidence supporting the need for interdisciplinary collaboration within healthcare is mounting both nationally[12–16] and internationally. As interprofessional collaboration and evidence-based practice become increasingly important to effective health delivery, a better understanding of how to increase research use by all health professions is critical. Currently, we have limited knowledge of the use of KT strategies in allied health professions. Presently, the allied health KT literature contains two systematic reviews that have examined strategies to aide guideline implementation[18, 19], which is one of many ways to put research into practice. In the review by Thomas et al., only one of 18 studies focused on dietitians (i.e., allied health professionals), while the remaining seventeen studies targeted nurses and physicians. Thus, limited conclusions could be drawn in relation to allied health professional practice. In the second systematic review, Hakkennes and Dodd examined 14 studies that used single and multiple KT interventions. Education-related interventions were the most commonly used interventions in their review; however, Hakkennes and Dodd described equivocal findings of the guideline implementation strategies across studies. In addition to the aforementioned systematic reviews on guideline implementation, a third systematic review by Menon et al. examined a variety of single and multi-component KT strategies to improve knowledge and attitudes regarding evidence-based practice and evidence-based practice behaviours in occupational therapy and physiotherapy practice. Overall, the findings highlighted that there was limited evidence for the effectiveness of the KT strategies; however, they suggested strong evidence pointed to the effectiveness of an active, multi-component KT intervention for changing practice behaviours of physiotherapists (i.e., physical therapist). Broadly, there has been limited success identifying consistently effective KT interventions. Partially, this may be attributed to a general lack of theory-driven KT interventions. Recent evidence suggests that less than 10% of studies on guideline implementation explicitly reported a theoretical rationale for the selected KT intervention. Theory-driven interventions use established theory to select and develop the KT interventions through articulating the desired behaviour change, as well as the factors and mechanisms that may shape this change, such as autonomy and scope of practice (which may vary widely across health disciplines, and potentially across geographical jurisdictions)[23–27]. A theoretical-informed approach offers the advantage of a generalizable framework to: inform the development and delivery of interventions; guide evaluation; explore moderating factors and causal mechanisms; and facilitate a better understanding of the generalizability and replicability of implementation interventions. While there is growing interest in the use of theory-informed knowledge translation interventions[28, 29], little empirical evidence exists that interventions designed using theory are superior to non-theory informed interventions, however evidence is starting to emerge. As a result, the generalization of research evidence about KT interventions across disciplines is questionable given the lack of explicit theory-informed interventions. Systematic reviews must reflect these important discipline-specific nuances through synthesizing knowledge from disciplines that have similar scope of practice and autonomy, for example. A related point that is commonly overlooked in the literature, yet bears important implications for KT, is that changes in knowledge and attitudes do not necessarily facilitate behaviour change (i.e., increased use of evidence-based practices). offer guidance for KT researchers in terms of the development of KT interventions for interprofessional healthcare teams. This review followed a modified systematic review protocol in order to synthesize diverse forms of research evidence. The study procedures we applied are documented in a previous publication. Our methodological approach for extracting data, assessing intervention reporting, and conducting methodological quality assessment of the qualitative studies are described in detail below because they were either not described in the study protocol or they were adjusted during the systematic review process. A health research librarian developed and implemented search strategies in eight electronic databases (MEDLINE, CINAHL, ERIC, PASCAL, EMBASE, IPA, Scopus, CENTRAL) using language (English) and date restrictions (1985 to March 2010) (Additional File1). The decision to restrict to English studies was informed by recent systematic research evidence that suggested there is no empirical evidence of bias if papers written in languages other than English (LOE) are excluded. These date restrictions reflect the emergence of the evidence-based medicine/evidence-based practice and the knowledge translation movements and were purposively selected to capture all relevant literature. Relevant dissertations, reference lists of included studies, key journals and conference proceedings from 2005 to 2010 were also searched for relevant citations. Studies were included if they met the criteria outlined in Table1. Studies were not excluded based upon research design. Primary research studies, including experimental, quasi-experimental, and non-experimental designs (e.g., case study). Interventions/strategies with a primary purpose of translating research (or enhancing research uptake) into clinical practice; examples of potential interventions include reminders, use of multidisciplinary teams, educational programs, researcher-clinician interventions. Empirically assessed change (by way of quantitative or qualitative data) at the professional/process level (e.g., change in clinical practice), patient level (e.g., improved response to the clinical practice intervention) or the economic level (e.g., change in costs). Two reviewers independently screened the search results (i.e., titles and abstracts) using broad criteria, and reviewed the full-text of potentially relevant articles using standard forms and predetermined inclusion criteria. Disagreements were resolved by discussion or third party adjudication. Study data were extracted using a modified version of the Cochrane Effective Practice and Organisation of Care Review Group (EPOC) Data Collection Checklist (Additional File2). This classification scheme is currently used by the Cochrane Collaboration and widely used by other researchers. Research design was determined using an algorithm (Additional File3) because of its user-friendly format, which helped to identify a variety of research designs and standardize responses across reviewers. Other than to identify research design, the EPOC Data Collection Checklist was used as published. Data were extracted by one reviewer and verified by a second reviewer. Disagreements were resolved by discussion or third party adjudication. The descriptions of the KT interventions in each study were compared to the Workgroup for Intervention Development and Evaluation Research (WIDER) Recommendations to Improve Reporting of the Content of Behaviour Change Interventions (Additional File4). These recommendations emerged from recommendations in the Consolidated Standards of Reporting Trials (CONSORT) agreement. Developed in 2008, the WIDER Recommendations comprise four categories: detailed description of interventions in published papers; clarification of assumed change process and design principles; access to intervention manuals/protocols; and detailed description of active control conditions. In order for a description of a behaviour intervention to meet these criteria, the description must contain all of the components described within each recommendation. The descriptions of the KT interventions were compared to the WIDER Recommendations by one reviewer and verified by a second reviewer. Two reviewers independently assessed the methodological quality of included studies; disagreements were resolved through discussion or third party adjudication. The methodological quality of quantitative studies was assessed using the Quality Assessment Tool for Quantitative Studies (Additional File5). The results from the tool led to an overall methodological rating of strong, moderate, or weak in eight sections, including: selection bias, study design, confounders, blinding, data collection methods, withdrawals/dropouts, intervention integrity, and analysis. This tool has been previously evaluated for content and construct validity, and inter-rater reliability, and meets accepted standards. The methodological quality of qualitative studies was assessed using the Quality Assessment Tool for Qualitative Studies (Additional File6), which differs from the quality assessment tool described in the study protocol. This framework assesses five aspects: the aims of the research; research methods and design; sampling; data collection and analysis; and results, discussion, and conclusions. Previous research on this tool has reported a kappa score of 0.526, which indicates moderate inter-rater agreement. We chose this tool because of structural similarities to the tool used for quantitative studies, which made the results more comparable, and the increased ease of presenting the individual quality criteria of the qualitative and quantitative studied included in this review in order to facilitate study comparison. All studies were included in data synthesis. No studies were excluded based on the quality assessment. Several steps were taken to analyze and synthesize study data. First, analysis occurred on a profession-by-profession basis with study data grouped and analyzed by study design. Second, data were aggregated and analyzed according to the type of KT intervention strategies within each of the allied health professional disciplines. From this, we completed a descriptive (narrative) analysis of the included studies and identified potential patterns (e.g., similarities, anomalies, et al.) in terms of targeted behaviours, study outcomes, and intervention effectiveness. This narrative review satisfied two goals: it allowed us to examine strategies that were successful across professions, and to explore what it was about different strategies that worked, for whom, and under what circumstances. Third, we synthesized the evidence across the professions to reflect the interprofessional nature of Canada’s healthcare landscape. A detailed description of the planned meta-analysis is contained in the study protocol; however, meta-analyses could not be conducted due to methodological and clinical heterogeneity of the studies. Thirty-two studies met our inclusion criteria (Figure1)[45–76]. Both quantitative (n = 29) and qualitative (n = 3) research designs were represented. Within each profession, the heterogeneity of the study designs, KT interventions, targeted behaviours, and study outcomes precluded combining comparable results. Table 2 summarizes the 32 studies, including important study elements, and is organized by discipline and study design. The 32 studies included diverse KT interventions. Fifteen studies investigated a single KT intervention (pharmacy n = 5, physiotherapy n = 2, occupational therapy n = 4, dietetics n = 3, speech-language pathology n = 2)[46, 50, 51, 53, 54, 59, 60, 63, 64, 67–69, 71, 75, 76]. Seventeen studies examined multiple KT interventions (pharmacy n = 7, physiotherapy n = 9, occupational therapy n = 2)[45, 47–49, 52, 55–58, 61, 62, 65, 66, 70, 72–74]. Following the EPOC classification scheme, the predominant single KT intervention was educational meetings (n = 11)[46, 51, 53, 54, 59, 63, 64, 69, 71, 75, 76], followed by educational materials (n = 2)[50, 67], educational outreach visits (n = 1), and a financial intervention (n = 1). The studies employing multiple interventions all contained at least one education-related component. Nine of these studies used education interventions exclusively: educational meeting and educational material (n = 7)[47, 48, 56, 61, 62, 65, 73]; educational outreach visit and educational material (n = 1); educational meeting, educational outreach visit, and educational material (n = 1). The remaining eight studies employing multiple interventions represented the following combinations: educational meeting and reminders (n = 2)[57, 70]; educational material and mass media (n = 1); educational meeting and local opinion leaders (n = 1); educational meeting, educational material, and reminders (n = 1); educational meeting, educational outreach visit, and audit and feedback (n = 1); educational materials, educational outreach visit, and mass media (n = 1); educational meeting, educational material, and local opinion leaders (n = 1). Table 3 describes the KT interventions of the studies in greater detail. When the KT interventions were examined by profession, educational meetings were used most often in dietetics (n = 3; 100% of dietetics studies)[46, 53, 63]; occupational therapy (n = 3; 50% of occupational therapy studies)[59, 75, 76]; pharmacy (n = 3; 25% of pharmacy studies)[51, 54, 69]. Pharmacy studies employed the widest range of interventions, including multiple interventions (n = 7; 58%)[45, 49, 55–58, 62, 65], educational meetings (n = 2; 16%)[54, 69], educational material (n = 1; 8%), and financial intervention (n = 1; 8%). Two speech-language pathology studies were included in this review; the KT interventions were educational meetings and educational outreach visits. The studies assessed outcomes at different levels; therefore, we applied the EPOC classification scheme (i.e., professional/process outcomes, patient outcomes, and economic outcomes). Of the 32 included studies, the primary outcomes were professional/process outcomes (n = 25)[46, 47, 49–59, 63–68, 70, 71, 73–76], patient outcomes (n = 4)[48, 60, 62, 72], and economic outcomes (n = 2)[61, 69]. One study identified both professional/process and patient outcomes as primary outcomes (e.g., professional/patient communication and patient education). The dietetics, occupational therapy, and speech-language pathology studies used only professional/process outcomes to assess KT interventions. The pharmacy and physiotherapy studies identified a wider range of outcomes. The outcomes of the pharmacy studies were: professional/process (n = 8)[49–51, 54–57, 65], patient (n = 2)[60, 62], economic (n = 1), and combination professional/process and patient outcomes (n = 1). The outcomes of the physiotherapy studies were: professional/process (n = 8) e.g., 48,52,58,64,70,73-76], patient (n = 2)[47, 72], and economic (n = 1). The studies using educational meetings as the single KT intervention used professional/process outcomes (n = 10)[46, 51, 53, 54, 59, 63, 64, 71, 75, 76] and economic outcomes (n = 1). Some studies did not clearly identify a primary outcome from a host of outcomes measured. Further, it was typical for an identified primary outcome to be measured in multiple ways. At times, this practice led to mixed results within the main outcome(s). To address this, we looked for consistency (e.g., all positive or all negative effects) within the results. We categorized studies that reported both positive and negative effects for the same outcome as having ‘mixed effect.’ Studies that had all positive or all negative effects for the same outcome were categorized as ‘consistent effect.’ Studies in which the results were not clearly linked to the identified outcome(s) were classified as ‘unclear,’ and studies in which there were no comparative statistics provided or results were not reported for the identified outcome(s) were classified as ‘not done’. As described in Table2, less than a third of the quantitative studies showed a consistent effect on primary outcome measures (n = 8)[47, 48, 50, 52, 64, 65, 71, 72]. Five studies could not be classified as consistent or mixed effect on primary outcome measures: unclear (n = 2) i.e.,58,70], not done (n = 3)[57, 59, 67]. Sustained positive attitude and beliefs about evidence-based practice. Variable performance related to evidence-based practice knowledge and behaviours. Participants developed their ability to use 6 different types of reflective thinking, which brought about perspective changes in their clinical decision-making process and sometimes lead to application in professional practice. Perspective changes were not achieved at the same pace/level by all participants. The intervention enhanced the participants learning and allowed them to offer a greater quantity and variety of services to their patients. 1Secondary outcomes measured at the level of economics with mixed effect. 2Secondary outcomes measured at the level of the patient with mixed effect. 3Secondary outcomes identified at the level of the professional/process with positive effect; however, comparative statistics were not done. 4Secondary outcomes measured at the level of the professional/process with a consistent, statistically significant, positive effect and Tertiary outcomes measured at the level of the professional/process with consistent effect (non-significant). 5Secondary outcomes measured at the level of the patient with mixed effect. 6Secondary outcomes measured at the level of the professional/process with mixed effect and the level of economics with consistent effect (non-significant). 7Secondary outcomes measured at the level of the patient with consistent effect (non-significant). 8Participants exposed to other interventions (not described or measured in this research report) as part of an ongoing, community-wide effort to translate research evidence into practice. 9Secondary outcomes were identified at the level of the professional/process; however, results were not reported. 10Secondary outcomes measured at the level of economics with consistent effect (non-significant). 11The intervention also included an optional educational outreach visit; however, data was not collected or reported on this aspect of the intervention. 12Secondary outcome measured at the level of the professional/process with mixed effect. 13The intervention had an additional component termed ‘on demand feedback and advice’ that cannot be classified within the EPOC frameworkiple (n=1 (n=21. 14Secondary outcomes measured at the level of the patient with mixed effect. 15Secondary outcomes measured at the level of economics with consistent effect (non-significant). 16The intervention had an additional component termed ‘monitor progress, provide assistance on as needed basis via email, telephone, in-person’ that cannot be classified within the EPOC framework. The majority of the quantitative studies (n = 16) demonstrated ‘mixed effects’ on primary outcome measures[45, 46, 49, 51, 53–56, 60–63, 66, 69, 74, 75]. The research designs of the studies demonstrating mixed effects were: randomized controlled trial (n = 5)[46, 53, 61, 62, 74], retrospective cohort study (n = 2)[60, 69], non-concurrent cohort study (n = 1), before-after study (n = 6)[45, 49, 55, 56, 66, 75], and cross-sectional study (n = 2)[51, 63]. Eight studies demonstrated a consistent effects on primary outcomes; however, four studies demonstrated effects that were not statistically significant[48, 64, 71, 72]. The remaining four studies demonstrated a statistically significant, positive effects on primary outcomes[47, 50, 52, 65]. Bekkering et al. conducted a randomized controlled trial that examined a group of physiotherapists (n = 113) attempting to implement clinical guidelines for low back pain by using multiple, education-only interventions (i.e., educational material and educational meeting). The physiotherapists in this study reported a statistically significant increase in adherence to the main recommendations of the guidelines. Bracchi et al. conducted a non-concurrent cohort study that examined a group of pharmacists (n = 261) attempting to change adverse drug reaction reporting procedures by using educational material as a single KT intervention. In this study, the results from the control year were compared to the results from the study year and the study region was compared to a control region during both years. As a result, a statistically significant increase in the number of adverse drug reaction reports and the number of ‘appropriate’ adverse drug reaction reports were reported in the study region. Brown et al. conducted a cross-sectional study that examined a sample of physiotherapists (n = 94) attempting to change fall prevention strategies by using multiple, education-only interventions (i.e., educational outreach visits and educational material). The physiotherapists participating in this study reported a statistically significant increase in the frequency of self-reported fall prevention practice behaviours compared to one year prior to the study intervention. Martin et al. conducted a before-after study that examined a group of pharmacists (n = 25) attempting to change tobacco cessation counseling by using multiple, education-only interventions (i.e., educational meetings and educational material). The pharmacists in this study reported a statistically significant increase in self-efficacy measures and current skill measures for the 5A’s counseling process post-intervention. Secondary outcomes were measured and reported in 12 of 29 quantitative studies[52, 53, 55, 57–61, 64, 71, 72]. The secondary outcomes were: professional/process outcomes (n = 4)[52, 57, 59, 72], patient outcomes (n = 4)[53, 55, 61, 64], economic outcomes (n = 3)[58, 60, 71]. One study measured both professional/process and economic secondary outcomes. Of these studies, one study demonstrated a consistent, statistically significant, positive effect, and four demonstrated consistent, statistically non-significant effects on secondary outcome measures[58, 64, 71, 72]. Six studies showed ‘mixed effects’[53, 55, 59–61, 72]. Two studies did not provide comparative statistics and were classified as ‘not done’[52, 57]. When the intervention effects were examined by profession, two disciplines contained the four quantitative studies that consistently demonstrated consistent, statistically significant, positive effects on primary outcome measures: pharmacy (n = 2)[50, 65] and physiotherapy (n = 2)[47, 52]. The studies with consistent, non-significant effects on primary outcome measures were as follows: physiotherapy (n = 3)[48, 64, 72] and speech-language pathology (n = 1). All of the dietetics studies (n = 3) demonstrated mixed effects[46, 53, 63]. Mixed effects were also reported for the primary outcome measures in the following professions: pharmacy (n = 9)[45, 49, 51, 54–56, 60, 62, 69]; physiotherapy (n = 3)[61, 74, 75]; occupational therapy (n = 2)[66, 75]. Ten RCTs were included in this review representing the following professions: physiotherapy (n = 6)[47, 48, 61, 70, 72, 74]; dietetics (n = 2)[46, 53]; pharmacy (n = 1); speech-language pathology (n = 1). These studies employed a variety of KT interventions: multiple, education-only (n = 5)[47, 48, 61, 62, 74]; single educational meeting (n = 3)[46, 53, 71]; multiple interventions (i.e., education intervention and another non-education intervention) (n = 2)[70, 72]. Five studies demonstrated mixed effects on primary outcomes[46, 53, 61, 62, 74], four studies demonstrated consistent effects on primary outcomes[47, 48, 71, 72], and the effects of the intervention on the primary outcome in the remaining study was unclear. Of the four studies demonstrating consistent effects on the primary outcomes, three studies demonstrated non-significant effects[47, 71, 72] and the remaining study demonstrated statistically significant, positive effects on the primary outcome. The three qualitative studies included in this review represented the following professions: speech-language pathology, physiotherapy, and occupational therapy. Molfentner et al. conducted a qualitative study using the knowledge-to-action (KTA) process model framework to address an identified KTA gap in dysphagia rehabilitation practices for speech-language pathologists (n = 4). This study employed a single KT intervention (e.g. educational outreach visits), and after conducting post-intervention interviews with the study participants, it was determined that ‘the intervention not only enhanced their learning, but also allowed them to offer a greater quantity and variety of services to their patients. Clinicians reported that having hands-on training by a research S-LP was more effective than a lecture on the same topic.’ Schreiber et al. conducted a qualitative, participatory action research study to identify, implement, and evaluate the effectiveness of strategies to incorporate research evidence into clinical decision making in physiotherapy (n = 5). Gathering data through semi-structured interviews, this study reported that multiple, education-only interventions (e.g. educational meetings and educational materials) gave rise to themes that included ‘sustained positive attitudes and beliefs about evidence-based practice, variable implementation of the strategies developed during the initial collaboration phase, variable performance for individual goals; persistent barriers, including a lack of time and a lack of incentives for evidnce-based practice activities; and a desire for user-friendly evidence-based clinical practice guidelines.’ Vachon et al. conducted a qualitative study using grounded theory to describe how rehabilitation professionals use reflective learning to incorporate research evidence into clinical decision making and to identify factors that influenced the reflective learning process. This study employed a single KT intervention (e.g. educational meetings) with a population of occupational therapists (n = 8). Data were collected via meeting videotapes, transcripts, written critical incident descriptions, reflective journals, and the facilitator’s notes and summaries. Through this intervention, ‘the participants developed their ability to use different types of reflective thinking, which brought about perspective changes… however, perspective changes were not achieved at the same pace or the same level by all participants. Some personal and contextual factors were found to influence the participants’ ability to learn reflectively’. These three studies employed both single and multiple education-related KT interventions targeting an allied health professional’s general management of a problem or evidence-based practices[73, 76]. The behaviour changes in all three studies were evaluated using the professional/process outcomes. While there were some encouraging findings, such as sustained positive attitudes and beliefs, ability to use different types of reflective thinking, and enhanced learning and services, all of the studies acknowledged variable practice changes related to the targeted behaviours. The quality and detail of the reporting of the KT interventions varied widely between the 32 study reports; therefore, the published intervention descriptions were compared to the WIDER Recommendations to Improve Reporting of the Content of Behaviour Change Interventions, which were developed in 2009. While a small number of studies met three of the four criteria, none of the 32 studies satisfied all four of the WIDER Recommendations. However, it is important to note that some authors reported more intervention details than others (Table3). Many of the studies described components of the first recommendation, such as descriptions of intervention recipients, the intervention setting, the mode of delivery, and the intensity and duration of the intervention. Nevertheless, most did not provide a full and detailed description, which would include a description of the characteristics of the individuals delivering the intervention, the adherence/fidelity to delivery protocols, or a detailed description of intervention content. A number of studies provided an outline of the intervention objectives. In relation to the second recommendation, four studies described in detail the clarification of assumed change process and design principles[49, 64, 68, 76]. Several studies included a description of a theoretical framework informing their research, the rationale behind and impetus for the intervention, and the behaviour that the intervention was intended to change; however, most did not describe the development of the intervention, the change techniques used in the intervention, or the causal processes targeted by these change techniques. Only five studies fulfilled the third recommendation of providing access to intervention manuals or protocols within the article or in separate publications[49, 58, 62, 64, 67]. Most studies were exempt from the fourth recommendation because the study designs did not include a control group (n = 17)[45, 49, 52, 54–59, 65–68, 71, 73, 75, 76] or active control conditions (n = 12)[46–48, 50, 51, 53, 60–64]. None of the three studies with active controls satisfied this criteria[70, 72, 74]. Table 3 contains an overview of the WIDER Recommendations in relation to each of the included studies. We assessed the 29 quantitative studies and three qualitative studies using separate tools(Additional File 7), six quantitative studies received a moderate rating[48, 54, 55, 62, 74, 75], and 23 studies received a weak rating[45–47, 49–53, 56–61, 63–67, 69–72]. None of the 29 quantitative studies received a strong rating. Additionally, of the four studies that demonstrated consistent, significant positive effects on the primary outcomes illustrating that the KT interventions had effectively changed the identified behaviours, it is important to note that all received a weak rating using this methodological quality assessment tool. Based on the Quality Assessment Tool for Qualitative Studies, with higher values denoting higher study quality, one qualitative study was given a rating of five and the other two studies were rated two and one, respectively. The following items were changed during the research process; therefore, the study protocol should be adjusted to reflect these changes: the inclusion criteria was clarified according to the EPOC Data Collection Checklist (Addition File2); the data extraction process was modified to include a research design algorithm (Additional File3) to be used in place of the study design component of the EPOC Data Collection Checklist; and the methodological quality assessment tool for qualitative studies that was described in the protocol was replaced with the Quality Assessment Tool for Qualitative Studies (Additional File6). This systematic review identified 32 studies that investigated a variety of KT strategies to put research into practice in the allied health disciplines. This review complements the extant research on broad approaches to put research into practice in particular disciplines, such as nursing e.g.,, and the reviews of specific KT strategies (e.g., audit and feedback, financial incentives) with a focus on medicine e.g.,[7–9]. Until now, reviews completed by Hakkennes and Dodd and Menon et al. provided the most comprehensive data on KT strategies in allied health; however, our review built on this existing research in several important ways. First, our review explored all types of interventions or approaches (i.e., a variety of professional and financial interventions) to put research into professional practice. Second, our review had a concise conceptualization of allied health that reflected typical, acute care health environments in Canada (i.e., containing five professions). Third, our review was inclusive of all research designs, which led to the inclusion of 32 studies across the five professions and reflects the largest review in this area conducted to date. Our findings make several important contributions to KT science, specifically in terms of the allied health professions, in three important ways: identifying a considerable reliance on educational interventions to change practice behaviour; clarifying the impact of outcome reporting bias; and innovatively employing the WIDER Recommendations as a framework to identify components missing from current research reporting behaviour change interventions. These three contributions will frame the following discussion. A number of studies[4–6, 26, 78–80] have clearly demonstrated that education alone has a limited impact on changing healthcare professionals’ clinical practices and behaviours. In this review, education-only approaches were frequently employed (n = 23) and our findings suggest that educational approaches on their own did not propel the desired provider practice change. Interestingly, 15 studies in this review employed a single KT intervention, with 11 of these studies using educational meetings. Results from the studies were inconsistent, with 16 of 29 studies demonstrating ‘mixed effects’ on the primary outcome evaluating the KT interventions. Eight of the quantitative studies demonstrated ‘consistent effects’ with the reported variables; however, four of these studies demonstrated consistently non-significant effects. All of the studies that illustrated consistently non-significant effects employed education-only interventions, with one-half employing single, educational meetings. These findings suggest a potential area warranting further exploration, that is, the exclusive provision of knowledge through educational interventions may not be adequate to change behaviour in the allied health professions. These findings stress the need for KT researchers to consider how other types of KT interventions may be used foster change. However, due to the poor reporting of the KT interventions, it is difficult to determine more specifically what intervention aspects contribute to behaviour change or lack thereof. It is important to note that the high frequency of educational interventions is not exclusive to the allied health professions, and a similar trend is seen in nursing and in the guideline implementation literature, which is largely dominated by physicians. Categorically speaking, educational interventions consist of a broad range of activities (e.g., educational materials, large-scale meetings, small scale meetings, outreach visits, et al.) intended to increase knowledge and skills with the expectation that new information will facilitate behaviour change. In many cases, the decision to change provider behaviour may not be straightforward, because it involves more than convincing healthcare professionals of the strength and rigor of the research informing the innovation. Often, provider behaviour change requires persuasion at multiple levels (e.g., healthcare professional, department decision-makers, et al.) and the allocation of significant resources to support the change. Individual healthcare professionals cannot simply decide to change their clinical practice and decision making to be aligned with an innovation (e.g., research-based clinical pathway, research-based protocol). Allied health professionals work within complex organizational structures and frequently as members of interprofessional teams; thus, behaviour change is complex due to a number of competing factors (many of which may be beyond their immediate control). As well, these competing factors that are beyond the typical ‘scope’ of an allied healthcare professionals’ practice suggest the need for KT researchers to consider the new possibilities, for example, institutional, organizational, or legislative. Our findings echo previous research that suggests that the effects of education on behaviour may be limited[5, 78, 80, 82–85], but may represent a necessary ingredient or first step in the process of change. In the studies reviewed, discrepancies between the outcomes described in the methods and results sections were common, and it was not always possible to reliably differentiate the primary outcome from secondary outcomes. This opacity was further compounded with some outcomes being measured using multiple tools and approaches. The resulting ambiguity led to substantial interpretation challenges. In the literature, the challenge of vague and incomplete reporting of outcomes has been referred to as outcome reporting bias, selective outcome reporting, and within-study selective reporting[82–86]. Generally speaking, outcome reporting bias refers to the selective reporting of some results but not others in publications. There is emerging evidence that this is a common problem in the literature, yet it is a difficult problem to pinpoint. Recently, studies have examined the extent and nature of outcome reporting bias through a review of publications and follow up surveys with authors and comparison of protocols with published study reports that, in some cases, were augmented with interviews with trialists. These studies have identified that outcome reporting bias is high in the literature[82, 86]. The implications of outcome reporting bias for healthcare research are significant. For example, an intervention may be considered to be of more value than it merits; on the other hand, not reporting all outcomes could lead to the use of ineffective or potentially harmful interventions. Other implications include a tendency to overestimate the effects of interventions because the primary outcome is the basis for sample size determination. Thus, when the primary outcome is replaced by a secondary outcome, erroneous results may result due to inadequate sample size. Our findings echo the need to limit outcome reporting bias in publications and to increase transparency in research reporting. Interventions to change healthcare professionals’ behaviours are deemed to be effective if they make a difference in terms of the identified outcomes. Clear descriptions of the intervention procedures are integral to understanding why an intervention works and facilitate replication of successful interventions. There is a burgeoning discussion of the extent of poor intervention reporting, with reports suggesting that in a review of 1,000 behaviour change outcome studies only 5% to 30% of the experimental studies described the intervention in adequate detail[87–90]. Clearly delineating intervention components, relationships between components, and the outcomes are essential to future development and implementation of the intervention and lead to future contributions to science and practice in terms of more confidence in large-scale replication. In response to poor intervention reporting, the WIDER Recommendations were developed to provide guidance. We applied the WIDER Recommendations to the studies in our review and our findings mirrored previous earlier documented reports[87–90]. All studies failed to meet the four critical criteria; as a result, we highlight the need to publish study protocols, make intervention descriptions and protocols publically available, and report interventions using the WIDER Recommendations. The strengths of this systematic review also represent its weaknesses. Methodological inclusivity was a key element of this study, which allowed us to review a large number of diverse studies; however, due to the heterogeneity of the 32 studies we were not able to conduct meta-analysis in order to determine definitive practice recommendations. As we stressed earlier, another limitation of our findings is that much of the literature included in this review was of a moderate or weak quality. Our findings provide the first systematic overview of KT strategies used in allied health professionals’ clinical practice, as well as a foundation to inform future KT interventions in allied healthcare settings. The findings of this review reveal an over-reliance on educational strategies without a clear effect on the intended outcomes; therefore, it is recommended that researchers establish a clear connection between the intended behaviour change and the KT interventions used to foster this change. Additionally, due to the nature and scope of work within distinct professions, it is important to note that the success of KT interventions does not necessarily transfer from one profession to another. For those charged with the task of putting research into practice, it is important to note that while educational interventions are the most common KT strategies in allied health, there is great variation in approaches to these interventions. Additionally, these KT interventions are not reported in enough detail to be replicable and the effects of these interventions are equivocal. For researchers and professionals tasked with ensuring that healthcare practices reflect the best available research evidence, it is important to be aware of the variability of individual interventions within the broader EPOC classification scheme of intervention categories. This review demonstrates that the most common KT strategy used in allied health is educational meetings; however, this category reflects a group learning situation that encompasses both interactive and didactic educational strategies. More research is required to examine the nuances of this EPOC classification scheme intervention category. Workgroup for Intervention Development and Evaluation Research. We would like to thank CIHR (Knowledge Synthesis Grant # KRS 102071) for providing the funding for this project. We also extend our thanks to the team at Alberta Research Centre for Health Evidence (ARCHE) at the University of Alberta, including Amy Beaith, Christine Ha, Andrea Milne, and Elizabeth Sumamo, for assisting with the review process. We would like to acknowledge the feedback and strategic advice provided by our International Advisory Panel members throughout this research project: Dr. Karen Grimmer-Somers, Director, Centre for Allied Health Evidence, School of Health Sciences, University of South Australia; Dr. Saravana Kumar, Senior Lecturer in Physiotherapy, School of Health Sciences, University of South Australia; Dr. Esther May, Head, School of Health Sciences, University of South Australia; Dr. Scott Reeves, Scientist, Keenan Research Centre, Li Ka Shing Knowledge Institute of St. Michael’s Hospital and Associate Professor, Faculty of Medicine, University of Toronto; Dr. Hugh Barr, President, UK Centre for the Advancement of Interprofessional Education (CAIPE) and President, General Practice with Primary Care Section of the Royal Society of Medicine and Honorary Fellow, Emeritus Professor of Interprofessional Education, University of Westminster. Finally, we would like to acknowledge the organizations that provide research personnel funding for members of our research team. SDS holds a CIHR New Investigator Award and Population Health Investigator Award from the Alberta Heritage Foundation for Medical Research (now Alberta Innovates – Health Solutions). GDCB was supported by a CIHR New Investigator Award and Population Health Investigator Award from Alberta Innovates. CAJ holds a CIHR New Investigator Award and Population Health Investigator Award from Alberta Innovates. ASN holds a CIHR Career Development Award from the Canadian Child Health Clinician Scientist Program in partnership with the SickKids Foundation, Child and Family Research Institute (British Columbia), Women and Children’s Health Research Institute (Alberta), Manitoba Institute of Child Health. SDS conceptualized this study and secured study funding from the Canadian Institutes for Health Research (CIHR). She designed and led this study. LA and KO coordinated the study team and the study itself; both assisted with the study design. The remaining authors assisted with the study design. In addition, DMD and LH provided methodological consultation. As well, KKB was the principal knowledge user for this study. All authors contributed to manuscript drafts and reviewed the final manuscript.